Create a variable that will get the computer name. In this example, the computer name is US-H2LXQ72. The next set of variables will list the Canonical Name (CN), Organizational Units (OU), and Domain Controller (DC) the computer is in. In this example, the Canonical Name of the computer is US-H2LXQ72, the computer is in the USA > Windows_7 Organizational Unit, and the computer is a member of the Software.Eng.APL domain. The Distinguished Name variable can be used to remove Path and LDAP from the output. 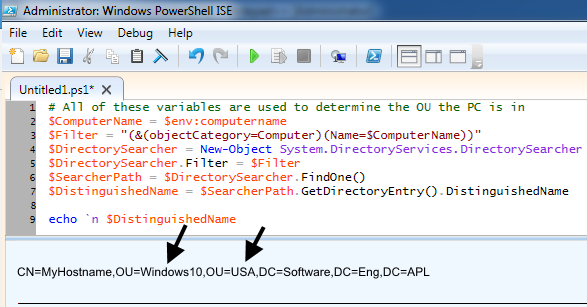 In this example, the computer named MyHostname is in the Windows10 OU, and the Windows10 OU is a child of the USA OU. The following can be added to only display the lowest OU the computer is in. echo "The computer named $($ComputerName) is in the $($OUMainName) OU"